Recently, I had to turn to my local PSK to get my passport renewed. I was anxious, and pretty worked up, having read numerous horror stories in the papers. Nevertheless, I had no other option, so I steeled myself and ultimately, my persistence paid off. So, for anybody else who needs information, please read on. First, log on to www.passportindia.gov.in and create an account for yourself. This website is very easy to navigate, helpful and contains all the information you may possibly need to apply for a passport. Once your account is created and validated, you will be asked to fill the online form. It’s a PDF form that you need to download. It’s easily understandable. Make sure you make no mistakes with the information you provide. Take your time, be thorough and as informative as possible. Next, you save the form in XTML format (the website only recognizes this format) and upload it through your account. Upload scanned copies of all accompanying documents that you need to submit – whether you apply for a fresh passport or a reissue. All documentation information is available on the website. It’s the next step that’s daunting. You have to book an appointment at the respective PSK you’ve chosen. For me, I had to try everyday at 3pm, and all appointments would be booked within 2 minutes flat. I’m serious! You have to start from about 15 minutes in advance, and keep clicking until the portal opens. After that, you getting through is a matter of sheer luck. I made it after trying for 5 days. And before you start getting ideas, multiple logins through different computers aren’t allowed! Once you get an appointment, make sure you report there at least half-an-hour in advance. You can calculate your fees online. Carry extra money just in case, and originals of the documents you’ve uploaded. I suggest you carry a few photocopies of the documents as well just in case. For instance, for reissue of a passport before its expiry, all you need to provide are copies of the first and last 2 pages of the passport. But I carried all important IDs – PAN card, driver’s licence, Adhar letter – and their self-attested photocopies to avoid any complications. When you’re in, you have to wait for your turn. Carry a receipt of your appointment confirmation; it has a barcode and batch number that you will need at the PSK. All PSKs have ATMs, XEROX machines and tiny food stalls so that you don’t have to go running about in case you need something. Wait for your Batch to be announced. When it is, you have to get your documents checked by a PP officer. He scans them, and if they’re ok, you’re given a token number. This number is flashed on their innumerable TV screens with a corresponding counter number. When your number comes up, go to the counter, submit the documents and fees, get your picture clicked and fingerprints stored and your file made. (In my case, this was counters A territory). Next, you wait for your documents to be verified. You move further down the hall to counters B and wait for your token number to be flashed again. When it is, you get the file verified (here you have to provide the originals) and move to counters C, where the Gazetted Officers sit. Your token number will be flashed again, and you will then get your file signed by a gazetted officer. S/He will go through your originals too, so please keep them carefully. There was a boy before me who lost some ID of his in the bargain! Finally, you take your file by the exit, and submit it. You will be given an acknowledgement letter, which you must keep carefully. The PSK will be crowded so try and get an early appointment. That way you get done sooner. The crowds swell and appointments get delayed, and you’ll then find yourself stuck for hours at an end. Do not even think of carrying documents that have errors – misspelt names, outdated addresses and the like. No amount of pleading will help because this is not a manual system anymore. You can’t bribe anybody to look the other way or be sympathetic, so be prepared and thorough. Again, the website provides ALL the information you need to know. The people working at these centers are very helpful, so don’t worry about what will happen too much. Relax. Once you have an appointment, you can rest assured that the remaining process is completely smooth. Everything is computerized and fast. The waiting can be a bit time consuming, so carry a book or watch a movie on your phone/tablet. 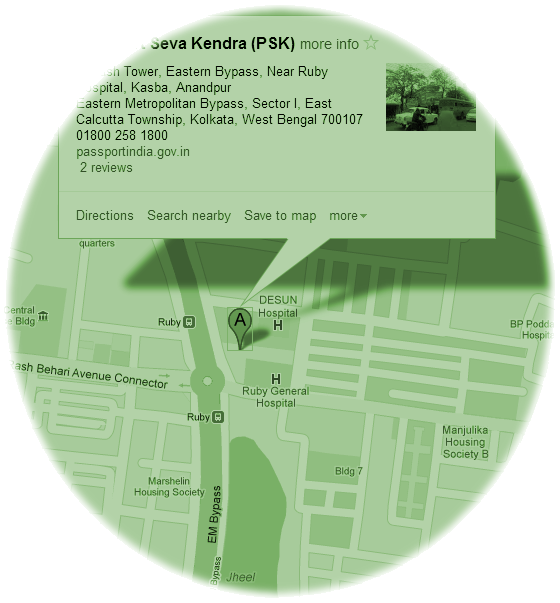 Lastly, the Kolkata PSK is in the building 781 Anandapur, next to Ruby Hospital. Don’t get confused by the lengthy address. There are tons of touts who sit outside, offering to help you out, but they’re unnecessary since you have to be there in person to register your photograph and fingerprints. They would simply ask for a lot of money, only to fill up and upload an online form. So steer clear and do it yourself. Tania Bhattacharya is a feature writer and editor. She likes traveling and trying out new cuisines. She worked in a leading news company in the Middle East for 4 years. I tried for more than 2 weeks and gave up .. I have a reasonably high speed internet connection (more than 6mbps upload / download).. but still after selecting the date I would get a browser error (500). Finally I had to pay Rs.2000 extra to a travel agent who booked it for us. In my opinion, this is a scam – these travel agents must be paying TCS to write some crappy code to block regular customers trying to book a slot. Also, the entire process needs to be revamped – why not provide appts first come first serve for all dates in the future ? Also, only allow slot booking for people who have already paid fees (need online payment gateway). Roy, it’s really difficult to get a date online. And this time of the year, when many students try admission outside and also many people visit abroad, it’s all the more difficult. i just wanted to know, what happens after the appointment. i have to reissue my passport so after completing the appointment and verification, when and how is the passport delivered? and do you have to be there in person at home to accept it or can someone else accept it on your behalf? The passport is usually delivered by Speed Post. Talk to the post office. They will explain better. How much time they are taking for re-issue of passport in normal mode? Just get ready to pay around Rs. 2000/- to any travel agent. Eventually I had to pay. Are those XEROX machines available around 10 A.M? One of my relatives (PIO) lived in Newzeland for quite some years and is possessing a Newzeland Passport. Can he also obtain an Indian Passport simultaneously? sir. how can chengd my old passport for new baarcod atchsted passport.